This week’s post is the first in a three-part introduction to the formal language of energy, as a foundation for subsequent discussion about just what it is that the energy concept deals with. My aim is to cover some essential ideas here—where they come from, how they relate to one another—in sufficient detail for later inquiry into the higher-level relationships between energy and societal futures. A central purpose of the approach I’m advocating is to maintain a connection between our understanding and use of energy-related concepts, and day-to-day experience of our physical world. It’s my contention that we might then be better placed to appreciate and respond to the societal dilemmas we’re confronted with through clear eyes—as free as possible from the fog of confused conceptions. To this end, I’ll commence from the outset by situating energy, as is proper to the nature of that concept, in a systems context—and this requires a basic introduction to systems ideas in their own right. Further along the track, we’ll then be able to build on these ideas—systems in general, and energy from a systems perspective—as appropriate to the inquiry at hand. The overall ‘narrative of ideas’ running through the three posts introduces three foundational ‘laws’ relating to the behaviour of physical systems in energetic terms. A very simple situation will be used to illustrate each of the three laws, providing an opportunity to appreciate what each means in terms of familiar experiences. Part 1introduces the systems view as an approach to thinking about any situation in which we’re interested, and with this as background, looks into energy law 1, that of energy conservation. In Part 2, I’ll look at energy law 2, relating to energy dispersal; and in Part 3 I’ll take an in-depth look at energy law 3, sometimes paraphrased as the ‘economy law’. In last week’s post, I introduced the energy concept as the capacity to do work or transfer heat. In establishing this relationship between energy, work and heat, we have a handy basis for linking energy—an abstract concept used to think and communicate about physical situations in which we’re interested—with direct physical-world experiences. For while work and heat have very precise meanings in this context—they are formally defined, abstract concepts in their own right—these meanings relate closely to the common use of these terms in everyday language. Before we delve further into energy, work and heat though, there’s a more basic matter that we need to deal with, one that goes right to the heart of developing an effective working relationship with the energy idea: a capacity is always a capacity of something. But just what is it exactly that has this capacity that we’re interested in? A system is a collection of related components contained within a given boundary. The central insight here is that taking a systems view involves treating the situation in which we’re interested as a whole, while at the same time recognising this whole as comprised of parts. This basic systems idea can be used to characterise anything at all in which we’re interested. For our specific purposes here, we’re dealing with physical systems, and hence the components or parts are material in nature. To set the scene, it will be useful at this point to say a little about the systems idea more generally. In the broadest of terms, taking a systems view involves considering ‘things in their contexts’. Systems in this sense are conceptual devices for organising our thinking in relation to situations: their particular utility is that they help to preserve an appreciation of the situatedness of the ‘things’ in which we’re interested. Compare this with the analytical approach to understanding a situation, whereby we break it down or reduce it to a set of components and then consider the components in isolation from one another. The systems approach attempts to deal with the shortcomings that arise when we overlook the ways in which a whole is more than the sum of its parts. It’s worth noting at this point that the way I’ve introduced the systems idea here is a step beyond the way in which this is often used. Very often, systems are discussed as if they are real entities—or collections of entities—that exist inherently i.e. independently of us; think for instance of the way in which we often refer to economic systems, transport systems, health care systems etc as things that exist in their own right. I’m making a distinction here between identifying real systems out there in the world, and thinking (and communicating) with systems ideas about our experience of the world. You’ll perhaps notice how this parallels the distinction introduced last week between energy as a real, object-like thing and energy as a concept for thinking about our experience. In other words, you can see here the same shift between ontology and epistemology, or being and knowing. This similarity in approach is very much intentional—in fact, this is the distinguishing feature of the particular systems view that I’m introducing here. The distinction we looked at last week arises as a direct consequence of taking just such an approach to thinking about systems. In essence, what I’m doing is bringing the inquirer within the boundary of the inquiry system. In other words, conducting a systemic inquiry into energy and society involves specifically including our own sense-making and interpreting processes within the scope of the inquiry itself. We are not just observers looking on from the outside; we’re participants in the situation that interests us. While there’s an entire field of theory and practice relating to systems, complete with competing schools of thought—for instance, between the traditional hard systems view of ‘systems as real things’ and the more recent soft systems view of ‘systems as ways of thinking’, discussed just now—there is a basic and easily grasped foundational model that provides most of what we’ll require for here. I introduced the elements of this in outlining the system concept a little earlier, but it warrants some closer attention. In essence, any situation can be characterised in terms of a three-level hierarchical model of system, sub-systems and supra-system, or whole, parts and environment—see the figure below. 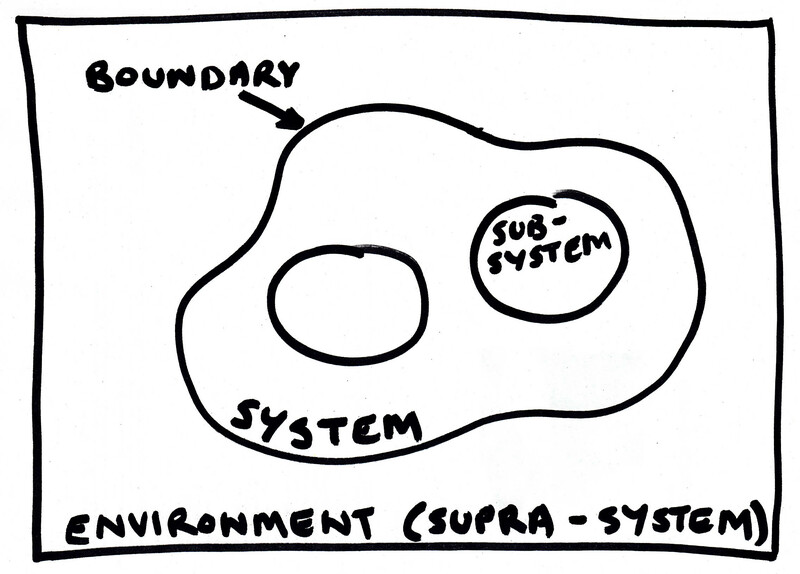 Applying the model is very simple: 1) any thing we’re interested in can, by drawing an appropriate boundary around it, be designated as a system; 2) every system is decomposable into sub-systems, or parts, that in interacting with one another give rise to the system’s relative wholeness; and 3) every system is contained within a supra-system or environment, from which it is relatively distinct. A key aspect of this model’s utility is the way in which it can be used to organise different perspectives on any situation. For instance, what counts as the system in one perspective can be a sub-system of the system in another perspective. Similarly with sub-systems in the first perspective: these can become the systems within another perspective, and the original system becomes the environment for these systems. This provides a powerful way to understand the different ways in which people—or the ways in which different people—are making sense of a situation. It also allows us to hold a comprehensive view of a situation without getting mired in detail that isn’t relevant to our interests, but also without relinquishing connection to that detail. The boundaries that we draw when looking at a situation through a systems lens are always a matter of judgement. Boundary judgements depend on what is relevant to our interests. There are no ultimately correct or true boundaries—but there may well be more or less adequate rationales for the boundaries we select, given our declared interests. On this basis, our system definitions can become a powerful basis for discussion and debate about questions of adequacy. Very often, boundaries are selected for practical reasons relating to the degree of complexity we can cope with. The systems way of thinking allows us to limit the level of detail that we deal with at any time, without losing the connections to, on the one hand, wider considerations (context or environment) or on the other, finer-grained considerations (sub-sub-systems or ‘parts of parts’). While it’s sometimes useful to think of systems in isolation, this is always a contrivance, a simplification for ‘what-if’ purposes—for instance, for thinking about the limits of a situation taken to its extreme. To think with systems generally means to think in terms of processes involving the transformation of inputs to outputs—in other words, systems interact with one another: the output of the processes that constitute one system’s activity or behaviour become the input to another system, which in turn transforms its inputs to outputs and so on. That is, systems do something; they are functional—and, when autonomous agents are involved (i.e. us) even purposeful. That should be enough to get us started. So far, the introduction to systems has been rather abstract. Let’s pick up the inquiry thread by returning to our earlier discussion of energy as a systems concept—a sense of what these ideas imply in practical terms should emerge as we proceed. To get us back on track: the energy concept is used to quantify the capacity of a system—specifically, a collection of material components—to do work or transfer heat. For energy to be defined, we need to identify an appropriate system boundary: a set of material components must be distinguished from their environment. The great utility of the energy concept—and what marks it specifically as a systems concept—is that it can be used to describe the whole system in which we’re interested (or at least, those aspects of the system for which it’s relevant, a matter we’ll return to later) ‘all-at-once’. This all-at-once view is related to the quantity known as the system’s internal energy (and in Part 3 we’ll also look at another way in which the all-at-once view plays out). At this point, to progress the discussion we’re going to need a number of further definitions—bear in mind that this is all in aid of working towards an appreciation of just what it is that the energy concept relates to; what it is ‘all about’ in a sense. So my intention is that the technical concepts, if introduced in an appropriate way, will eventually assist in connecting the abstract concept of energy with the realm of day-to-day experience. Let’s first return to the concepts of work and heat. Energy, as we’ve seen, quantifies the capacity of a system to do work or to transfer heat. These ideas occupy a fundamental place in industrial society. The vast material accomplishments of the brief industrial age are a product of work conducted on a scale that dwarfs the combined total of all that carried out over the entire course of prior human history. The overwhelming majority of this work has been enabled by heat liberated from the burning of fossil fuels. The common understanding of work as the expenditure of effort to bring about some desired end is a pretty good analogue for the formal physical definition of work as the product of a force and the distance over which it is applied. That is, work is calculated by multiplying the force by the distance, in the direction of the force, over which it acts. In thermodynamics—the branch of science and engineering that deals with the relationships between heat, work and the properties of systems—this is generalised to any action equivalent to or that can be converted to the raising of a weight through some height. We need to build up an additional piece of our systems view of energy here: the work done, or heat transferred, by a system, is always done on or transferred to another system. Heat transfer is any process by which energy flows from one system to another system as a result of a temperature difference between them—it is a transient process occurring at the boundary between the systems (or between a system and its environment—a system’s environment is, in a sense, the sum of all other systems with which the system of interest can interact; loosely speaking, the environment is a macro-scale system comprising everything else that is outside the boundary of our system of interest). Similarly, work always occurs across the boundary between systems, and is a transient phenomenon—work is done only while the associated action is occurring. Drawing on our systems terminology above, work and heat are always inputs or outputs from one system to another. Energy, work and heat transfer are all quantified with the same units—in the International System of Units this is the derived unit, the joule, J (or in base units, kg.m2/s2). When work is done by a system on another system, and when heat is transferred from a system to another system, the internal energy of each system changes by an equivalent amount. This is the basis for the law of conservation of energy—and (loosely speaking, but sufficient for our purposes) the basis for the first law of thermodynamics. Energy is conserved within a system isolated from its environment—a system for which there is no exchange of work or transfer of heat, and for which no mass enters or leaves. As stated above, the internal energy relates to a system as a whole. This affords this quantity a special status, that of a property of the system. The observable condition or configuration of a physical system at any time is known as the system’s state. A property is any quantity that describes an observable state of a system independently of how the system came to be in that state. For a given state, there is one value only for any property. So for a given observable system state, internal energy will remain constant. As a system’s configuration changes, it’s state changes, but the value of the properties describing those states may remain constant. This is the case when energy is conserved in an isolated system: the system may be changing between observable configurations or states, while a particular property of the system, its internal energy, remains the same. This is what it means for the system’s internal energy to describe that system ‘all-at-once’: we don’t need to know the details of what is happening with each of the components individually in order to understand what is happening with the system as a whole. In other words, by focusing on this quantity of internal energy, we’re afforded a systems view. There is one further extension to these fundamental concepts that we’ll need prior to looking at a very simple example of what this means in practice. This is the link between the system view and the component view, or between whole and parts. First though, this is an appropriate juncture at which to highlight that internal energy is the total energy for a system, relative to appropriate local frames of reference, defined—by us—for that system. As this implies, energy is not defined absolutely: it is always defined relative to a reference state. That is, when we talk about a system’s energy, we are always talking about the energy of that system from a particular point of view, the basis of which we must define. In considering changes in internal energy and hence changes in system state due to exchange of work and transfer of heat, we are always dealing with changes relative to that arbitrary reference state. In other words, energy is defined, in all cases, relative to the system description that we establish as appropriate for the situation in which we’re interested. There is no absolute measure of energy. With this as background, we can now look a little more closely at the relationship between a system’s internal energy, and the energy of its individual components. As stated earlier, the internal energy is the sum of the total or aggregate energy associated with all of the system’s components. We can now add that the energy of each component is relative to appropriate fixed local frames of reference for the system. This brings us to the next step in understanding what the energy concept is dealing with—what it is ‘all about’. The total internal energy of the system—and the total energy of each component, regardless of the physical nature of those components—is of two basic types. These are kinetic energy and potential energy. A system’s internal energy is equal to the sum of the kinetic energy and potential energy for all components. It’s therefore the sum of kinetic and potential energy that is conserved for an isolated system—kinetic and potential energy are not conserved individually, in fact for most ‘real world’ circumstances, there is a continual exchange between the two energy types. Height here means ‘height of the particle relative to the system’s reference height’—once again, and as with kinetic energy, this is not an absolute measure, but one local to the system in which we’re interested. In a moment, we’ll use this particular form of potential energy in an example. For now, the basic idea is that when a system’s components change position against some restoring force, the component’s and hence the system’s potential energy increases; when components change position under the action of the restoring force—when the restoring force moves the components—the component’s and the system’s potential energy decreases. The full range of possible forces—anything that exerts a push or a pull—could be involved, for instance the force of a compressed spring. 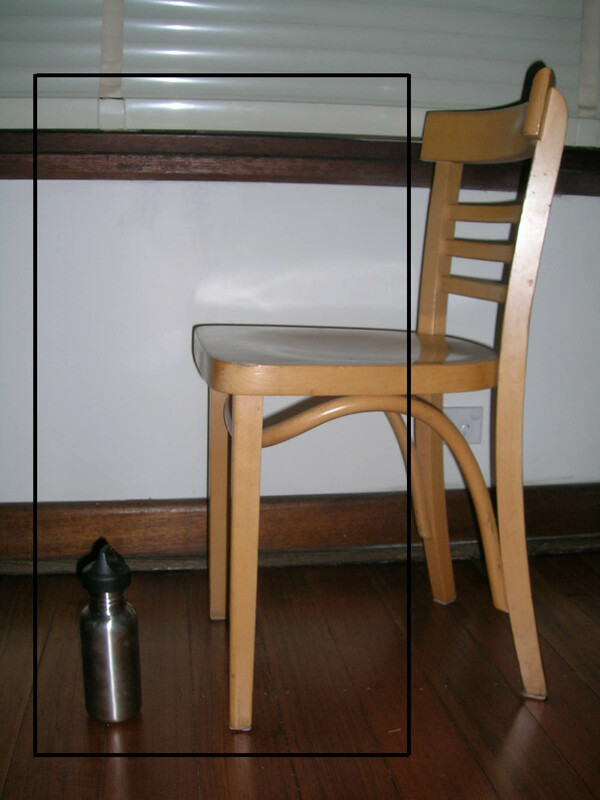 This—along with many of the other ideas discussed here—can be illustrated via a very simple system comprising a section of floor, the seat of a chair and a water bottle, as illustrated in the photo below; I’ve also indicated an appropriate system boundary. We’ll call this the chair-floor-bottle system. I’ve just described this as a very simple system; in fact, for the particular physical behaviour that we’ll be focusing on, the vertical motion of the bottle, it’s the most simple system possible. Our system comprises one component, with that one component having one degree of freedom, its vertical position. So the system itself has only a single degree of freedom. The number of independent degrees of freedom for a physical system provides a way of quantifying the system’s complexity. The total number of degrees of freedom is just the sum of the minimum number of coordinates required to fully describe the position of each of the system’s components. This configuration of the system we will designate as state 0; we’ll set this as the reference state against which to compare changes in the system’s internal energy. For state 0, the bottle is at rest, therefore its speed is zero relative to the system’s frame of reference. Note though that the system itself is not stationary. For instance, it is fixed to the Earth, which is rotating on its axis, as it orbits the Sun—so in absolute terms, the bottle is not stationary, but this does not matter to us, as kinetic energy is always defined locally, for the system that we define as relevant. The system is also contained within the Earth’s gravitational field, and so is subject to gravitational force—the gravitational field is an important environmental consideration for the system. We’ll set the floor level as the reference for changes in vertical position of the system’s components (for the changes to the system’s configuration—its state—that we’ll be considering, only vertical position will be significant). 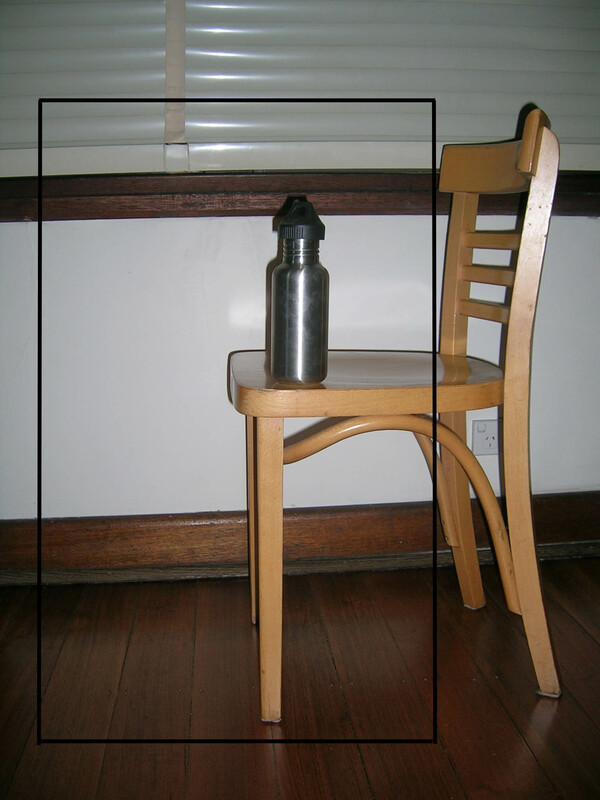 Imagine now that I lift the water bottle from the floor to the chair, so that the system is now in the configuration indicated in the next photo, which we’ll designate as state 1. The change in potential energy between state 0 and state 1 is equal to the work done in raising the bottle i.e. 5 J. And given that the bottle is at rest relative to the system’s reference frame in both the initial and final state—kinetic energy = 0 J—we can say that the change in internal energy is also 5 J. Note that as I did work on the system in raising the bottle—along the path between state 0 and state 1—the kinetic energy of the bottle was > 0. At any point along the path while the change was in action—at any intermediate state between state 0 and state 1—the internal energy could be calculated as the kinetic energy plus the (gravitational) potential energy. Provided, though, that the bottle was brought smoothly to rest on the top of the chair i.e. without overshooting this height and coming back down again, at all points along this path the internal energy was ≤ 5 J.
Let’s now consider what happens if the bottle is allowed to fall vertically from the height of the chair seat under gravity back to the floor, landing as in state 0 (requiring the input of a small amount of work from outside the system to initiate the change process—this doesn’t have any further implications though). We can see that the bottle, at the bottom of its path, must have a total energy of 5 J i.e. all of the potential energy is now converted to kinetic energy just as the bottle reaches the floor. The internal energy of the system, however, has remained constant at 5 J. The configuration of the system’s components at all points along the path taken during the change process correspond with a total kinetic plus potential energy of 5J. The bottle will contact the floor and be brought to rest. Superficially, it may appear that at the moment the bottle comes to rest, the system has now returned to its original state 0, however it’s also clear that the system’s internal energy must still be greater than at state 0 by a quantity of 5 J. The bottle’s kinetic and potential energy is now zero, relative to the system’s frame of reference, however the system’s internal energy, the sum of the system’s kinetic and potential energy, is still 5 J above its original state 0 reference point. What has happened to this internal energy? While the actual situation is more complex—for example, some of the internal energy will leave the system as work in the form of sound—we can take a simplified view in which we now make the bottle itself our system of interest, as shown in the photo below, with the boundary for the bottle system as indicated. 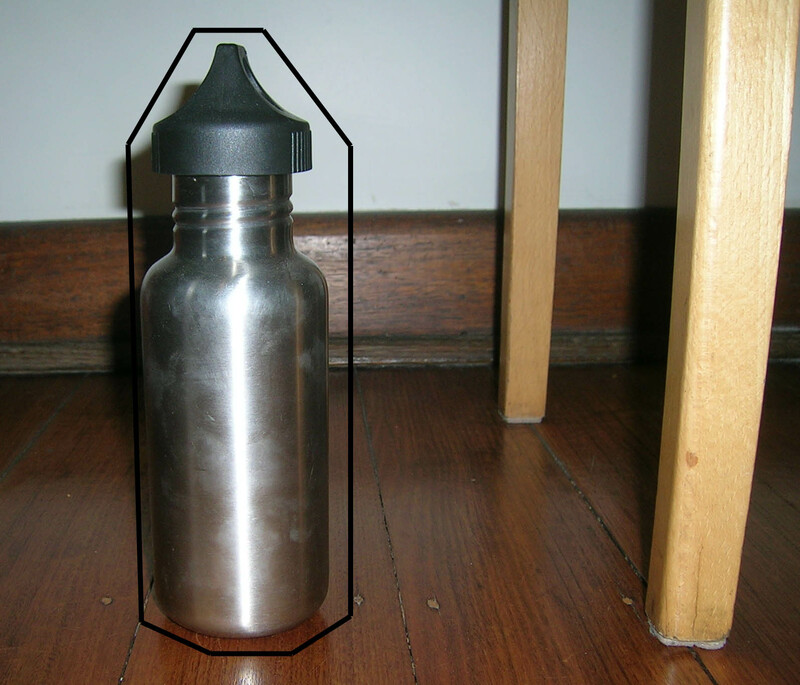 When the bottle comes to rest on the floor, the work done by the floor on the bottle in bringing it to rest—in this highly contrived example—will result in deformation of the bottle and eventually, dissipation of the associated energy into the bottle’s contents, and to the bottle’s environment. So we can say that at the moment the bottle comes to rest on the floor, the internal energy of the bottle system (a sub-system of the chair-floor-bottle system) is increased, nominally by 5 J (though recognising that in reality the actual increase in internal energy of the bottle will be less than this due to the other effects of the collision between bottle and floor). Over time, the bottle system’s internal energy, initially elevated in the form of an increase in the kinetic energy of the its components, will return to its state 0 value. The increased kinetic energy of the bottle’s components corresponds with an elevated temperature relative to the bottle’s environment; this elevated temperature enables heat transfer to the bottle’s environment and in turn to the chair-floor-bottle system’s environment, until the temperatures of bottle sub-system, chair-floor-bottle system and environment are the same (they are in equilibrium). So, provided there is no further work exchange or heat transfer, the chair-floor-bottle system will return to state 0, with a reference internal energy of 0 J. This is possible specifically because neither the bottle sub-system nor the chair-floor-bottle system is isolated from its environment. The scene is now set for introducing the second of the three foundational energy laws. I’ll take that up in Part 2 next week. This entry was posted in Foundational ideas and tagged conservation, energy laws, heat transfer, kinetic energy, potential energy, systems view, work by Josh Floyd. Bookmark the permalink.